Text source: Copyright © India Missions Association - Edited by Philipose Vaidyar / Global Prayer Digest. Used with permission. 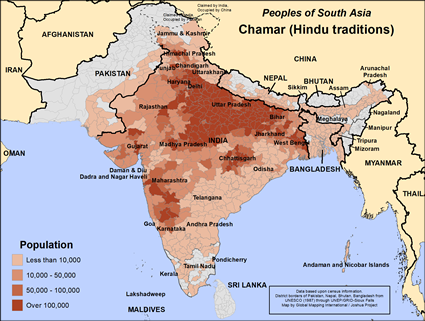 The Chamar people live primarily in India's western states of Uttar Pradesh, Madhya Pradesh, and Bihar. They are considered untouchable, and most of them know nothing else their entire lives. With a population of over 50 million, they are among the largest untouchable, or Dalit communities in the Hindu world. The Chamar people are also known as Bhambi, Asadaru, Khalpa, Machigar, Lingayat, Mochi and Rohit. They are regarded as untouchables or Sudras. To be untouchable, according to Indian-Hindu tradition, is to be undesirable, or unworthy of any sort of consideration or provision by society. This translates into frequent joblessness, lack of education and lifelong poverty. Traditional upper caste members will even avoid an untouchable's shadow. The Chamar use the Devanagari script and speak Kannada, Gujarati and Hindi along with regional languages. Their main occupation is manufacturing shoes and chappals from finished leather. Besides this, they are engaged in daily-wage labour and petty business. Day labor and petty business are also main sources of income, along with the manufacture of shoes and chappal, an Indian sandal. The origins of the name "chamar" come from their leather work. Women are also involved in agricultural work, animal husbandry and various economic activities. The Bhambi Khalpa community repairs musical instruments like dhol and nagara which are played in the temples during worship. Their staple cereals are rice and jowar. The Chamar regard themselves higher than the Mangs and the Mahars. The Chamar practice monogamy in marriage. Dowry is largely prevalent and is paid in cash and kind. Remarriage is allowed for widowers but not for the widows. The dead body of a bachelor is buried lying on its back with the head facing the south, whereas others are cremated and their mortal remains are immersed in sacred water. Rice balls are offered to the dead and to ancestors on the tenth day after death. The Chamar are Hindu. They belong to the Shiva and Bhagvat sects. Their deities are Bahiroba, Janai, Kandova of Jejori and Bhawani of Tuljapur. They follow the spiritual teachings of Ravidas. They recite mythological tales and sing songs from the religious epics. They celebrate the festivals such as Diwali, Panchami, Ganesh Chaturthi, Kartik, Holi and Hannami. There is a slightly higher degree of responsiveness to the gospel among the Chamars than among other Dalits. There is a church planting movement underway among Chamars in several districts across India. * For the salvation of the Chamar people and that God may send several Christian workers among them and meet their spiritual and physical needs. * For the Chamar people to break through the caste barrier; be accepted and accept other communities. * Pray that these Chamar believers will be salt and light to Chamar communities throughout India. * Pray that church planting will grow across all Chamar communities. 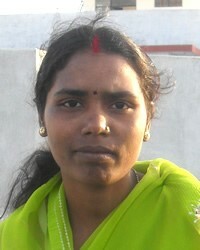 * Pray for more workers to enter the Chamar harvest.View Chamar (Hindu traditions) in all countries.